BIOS : Flash EEPROM - AMI BIOS.66MHz maximum bus speed. 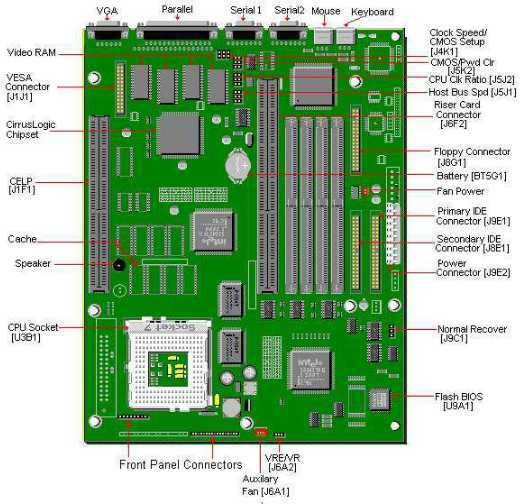 Bus Architecture : PCI / ISA based system bus. Cache : 16KB Level 1 Cache.End User units with the PB660 motherboard have a special CELP socket for an upgradeable COAST Cache module. CPU : Intel Pentium Processor 75MHz-133MHz.Uses Type 7 Zero Insertion Force (ZIF) CPU Socket. RAM : 8MB installed standard / 128MB maximum. Uses 4/8/16/32MB 72-pin SIMMs, 60 or 70ns, EDO or Fast Page RAM. Supports only non-parity DRAM. Video : Onboard Cirrus Logic 5446 video chipset. Video : RAM 2MB onboard. End user units include a special CELP socket for an upgradeable COAST Cache module. 1. Modules configured with 32k x 64 asynchronous SRAM with a 5v 8k x 8 SRAM Tag SRAM. Eight 32k x 8 3.3v srams are used for the Data rams (all are contained on the COAST module). 2. Modules configured with 32k x 64 burst or pipelined burst with either four 32k x 16 or two 32k x 32 (no parity) srams (also located on the COAST module). Commercial units have 256KB of Cache soldered on board which is notupgradeable. ** Requires Socket 7, and a flash BIOS update to 1.00.04.CP1R. Uses 4/8/16/32 MB 72-pin SIMMs, 60 or 70ns EDO or Fast Page Mode RAM.Supports only non-parity DRAM. 1. Bank by bank support for EDO or Fast Page Mode DRAM with automatic presence detect for EDO DRAM.60ns EDO required for 66 MHz bus speeds, and 70ns EDO required for 50 & 60 MHz bus speed.70ns Fast Page Mode required for 50, 60, and 66 MHz bus speeds.EDO and Fast Page Mode can be mixed in separate banks. 2. Four 32-bit SIMM sockets accept 4MB, 8MB, 16MB, 32MB in either single or double sided configurations.SIMMs must be added in pairs.SIMM sockets can be populated in any order.ONE or more SIMMs may be located under the peripheral bay in the Packard Bell "all-in-one" (Spectria) chassis. The PB660 uses CL-5446 Video Drivers.The PB660 has 2MB video memory and is not upgradeable further.